Below is an opportunity to navigate and use a live demo of the Flexion application. 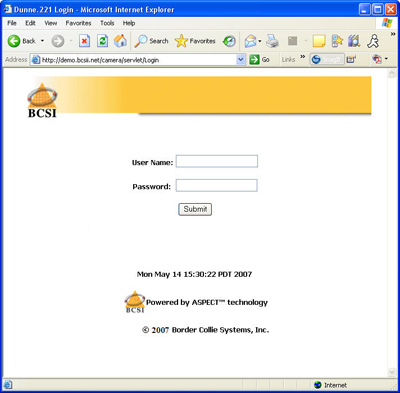 Clicking on the "click here to log-in" link below will send you to a new browser window just like the screen shot shown below. Once at the log-in screen, type in the username "admin" and the password "admin" and then click the submit button. (both the username and password will have no parentheses, just admin) Once you click submit you will be transferred into the Flexion application, showing a 16 camera system located at our headquarter offices.